The lodge is located on the banks of the Rio Grande, in Tierra del Fuego, just a few miles above the tidal influence. In the modern era, the Rio Grande has became the most productive sea-run trout fishery in the world. While trout numbers fluctuate with conditions at sea, tides, water levels, and a host of other natural factors?the fact is?we release 20 pound trout at Villa Maria each week of the season. A fish or two a day is the norm given average water conditions?but 6-8 fish days happen all the time! 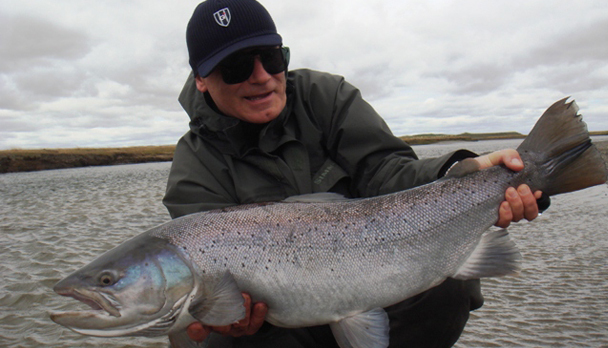 The lodge is located on the banks of the Rio Grande, in Tierra del Fuego, just a few miles above the tidal influence. 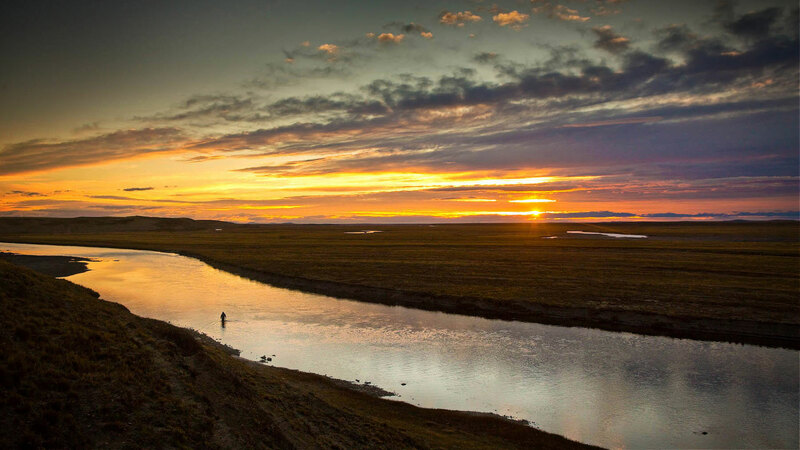 In the modern era, the Rio Grande has became the most productive sea-run trout fishery in the world. While trout numbers fluctuate with conditions at sea, tides, water levels, and a host of other natural factors-the fact is-we release 20 pound trout at Villa Maria each week of the season. A fish or two a day is the norm given average water conditions, but 6-8 fish days happen all the time! The Rio Grande flows from West to East, from the Andes to the Atlantic Ocean, through 70 km of Argentine territory. The landscape of Tierra del Fuego is reminiscent of Wyoming or the Scottish low country. It is a sparsely populated wilderness. Large sheep farming estancias share this land with herds of wild llama-like guanacos, red foxes, and condors, and the area is vast and beautiful. 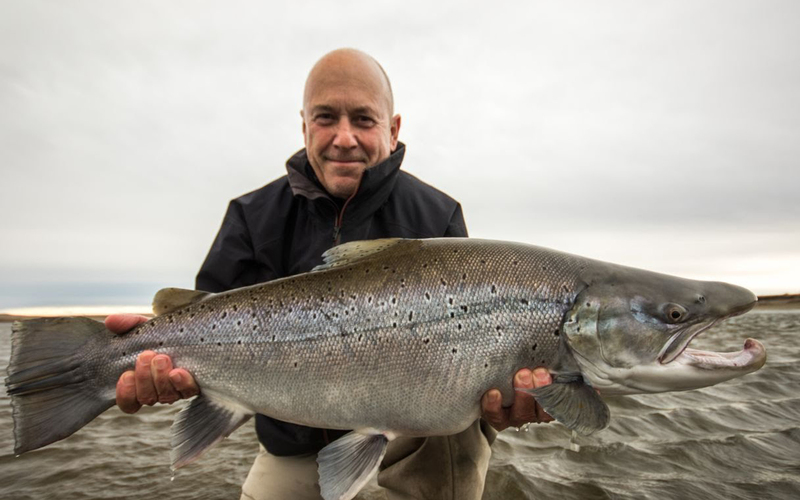 Anglers at Villa Maria get first crack of the whip at newly arrived sea-trout. On Villa Maria's pools, you'll see seagulls whirl overhead and smell the estuary salt. Just above the tides, the fish arrive fresh, with fins clear and scales silver. You'll fish both banks. Big pools and double-handers are the norm. There are big fish here, 20 pounders jump and leap and tear up and down the huge pools, while "fish of a lifetime" are landed each week. The lodge itself reminds many of the world's best salmon camps, warm, cozy, with cuisine and service at a very high level. Guides know the pools, the fish and the fishing; days are spent on the water, with classic "huts" for midday breaks. The lower Rio Grande is larger than the waters 40 to 50 miles upstream and anglers encounter nickel-bright sea-run browns in these pools. Access is strictly controlled by the ranch, so beats are assigned to our guests and the river is monitored to ensure that there is adequate water. The Lower Rio Grande will appeal particularly to the confident casters, and those anglers familiar with the two-handed rod. Like the water further upriver, the lower Rio Grande is shallow and easy to wade, although it is deeper in places. Fishing schedule: approx 9 hours. Lunch is taken at the river and its followed during the early season by a siesta in a strategic place and comfortable trailers. The afternoon session starts later during the months of Dec. and Jan. to capitalise on the magical dusk fishing hours. The lodge is situated in one of Patagonia's biggest and oldest estancias. It has four spacious and perfectly furnished bedrooms, featuring a cozy dining and living area, as well as a bar, well stocked with local spirits. The chef delightes us every evening, offering a selection of local and international cuisine accompanied by the best Argentine wines. A brand new cabin will be your home for lunch and a nice siesta before the afternoon session. The house accommodates only 6 anglers per week and is available on a limited basis, due to high demand by repeat parties. The staff working in the lodge consists of the managers (hostess and head guide), a chef and his helper, professional fishing guides, and housekeepers. All of them, from their own job, will guarantee an unforgettable vacation, putting all their knowledge and experience at your disposal, to meet your expectations and even surpass them. Single-handed rod #8 Wt or #9 Wt , 91/2 or 10 foot. Two handed rods are increasingly popular and allow anglers to cast a comfortable line with less effort, particularly on windy days.13 to 15 feet for a 9-11 Weight line. Rates include: Reception in Rio Grande airport and transfer to the Lodge (round trip); 7-night accommodation with all meals and beverages (including wine); 6 days fishing with bilingual and qualified guide; all ground transfers in the property. Rates do not include: Air ticket Buenos Aires/Rio Grande round trip; fishing equipment and flies; fishing license; personal health insurance; gratuities. Notes: Good discounts for 6 or 9 anglers group! The typical warm, windy summer prevailed, the conditions provided generally good fishing through the day, followed by some peaks in activity during the twilight hours. The following flies were used; dries, swung nymphs high in the water column, dredged a few pools with tiny flies, and used more traditional Rio Grande-style streamers where and when applicable. Everything seemed to work when fished properly! It was a similar story for fly lines. Everything from full floaters to short sinking tips had their moments of glory. And as always, good presentations and proper drifts helped ensure success. The largest fish caught during one week was 21 lbs and 32 were caught of 15 lbs. 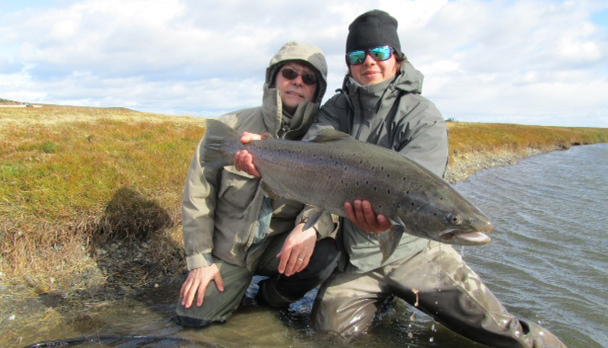 Marcelo (my husband) return very happy with the program, the service and because he caught 2 sea trout up to 20 lbs each.